The seventh Seal is a complete mystery -- just silence -- as it refers to the Coming of the Lord which is the biggest mystery in the Universe. Do not let anyone fool you that they know what this mystery means. We cannot interpret silence. Whatever you say it means, you are speaking where God was silent. So you have got it wrong. Where God is silent, we must also learn to be silent. God is planning to do something top-secret when He comes that we could never puzzle out in advance. God is planning some very unusual events so that our human ways can become subject to the control of His heavenly plans. So this introduction to Chapter 7 is the realization that it takes the merging of the supernatural in heaven, as God alone can fulfill the seventh Seal in a way that makes it a totally unexpected climax to the puzzling events on earth as described by the first six Seals. We need to find a deeper spiritual pattern that joins together seemingly disjointed data. So by inserting Chapter 7 between the first six Seals in Chapter 6 and the seventh Seal in Chapter 8, we see a pattern emerge of a Capstone separated from a basic pyramid. This is a classic symbol for the Coming of the Lord. The Coming of the Lord is also puzzling. When the Capstone sits on the pyramid, then the whole pyramid will look like the Capstone. The Bride will then be in their changed bodies . 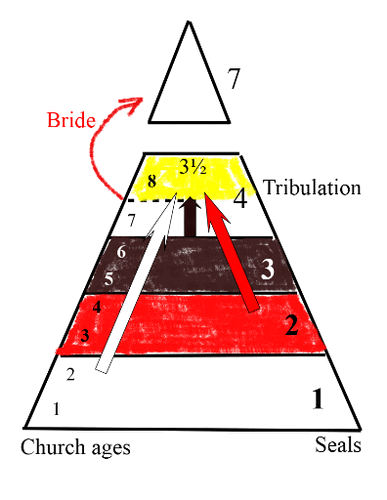 The Bride does not go through the Tribulation. Jesus has to meet the 144 000 Jews in Jerusalem at the end of the Tribulation. The saved foolish virgins, who were church-goers but never thought that it was necessary to be completely Scriptural, have to die in the Tribulation. The first four Seals deal with the rise of the Roman Catholic church to dominate and conquer the world religiously. The rider is the antichrist spirit. He is building up a worldwide church power combined with political power and money power for the Devil to take over when he gets kicked out of heaven. The Devil will then add into that toxic mixture the needed military power from ten dictators. Riding on a white horse, he represents religious deception. A bow without an arrow is a bluffer. Pope Nicholas I, around 860 AD, was the first western church ruler to be crowned. The second Seal saw the Roman Catholic church accept the military backing of the Roman empire to suppress its opponents, as the red horse symbolized bloodshed. Then, by crowning barbarian kings and claiming that only the Pope could get Saint Peter to open the door to heaven for them, the Catholic church rose to political power. The Roman Catholic church then began killing tens of millions of its opponents. The third Seal saw them selling the Word of God, and selling indulgences for the forgiveness of sin. The black horse symbolized spiritual darkness. Man-made denominational systems now infiltrated Protestant churches as they copied Catholic methods. Human opinion replaced the Bible. The dark error developed of bowing down to human church leaders and relying on belonging to a church with its human ideas and traditions. The Catholic church now gained extra influence as a money power. Religion became big business. The demonic spirit of the money changers that Jesus threw out of the Temple then entered the church as the wealthy Vatican City was established. Protestant churches joined in the pursuit for wealth. The fourth horse was pale and corpse-coloured. It is a mixture of the three colours white, red, and black. It is a dead horse walking, since Death rides it. On the second day of death the corpse colour starts to become green. "Chloros" in the Greek means pale and also means green. This fourth Seal represents all the evil of the seven church ages now uniting together. The flying eagle speaks to reveal the mysteries that turn the last church age back to the first church age. Then the Bride or wise virgins are caught up to heaven in what is known as the rapture or the second Coming. The rest of the fourth Seal, now that Life in the form of the Holy Spirit has left the earth, shows the entry of Death who destroys the foolish virgins. These are the saved Christians who were not restored to the early church and thus could not prove their beliefs just from Bible verses. They preferred human quotes to written Scriptures. They never learned to take the Bible seriously and chose to only listen to their pastor’s opinions instead. The fourth Seal ends the church ages. The wise virgins go up to heaven, and the saved foolish virgins get killed in the Tribulation. Virgins are clean women, symbolizing church Christians who got saved before the Tribulation started. The fifth Seal shows that God, throughout church history, has granted salvation to Jews who died for their faith. God saved the Jews who believed in the Old Testament. When Messiah came, God blinded the Jews to Him, and thus God still saves the Jews who believe in the Old Testament, and who get killed for their faith. That is why the Jews have been so badly persecuted. The Jews go into the Tribulation where 144 000 will secretly meet the Lord Jesus. They must then be killed. But they are first fruits, meaning they are resurrected up to protect the Bride as the Lord returns for Armageddon, which is the third Coming. It is the second resurrection that the "souls under the altar" as set forth in the fifth seal (Revelation 6:9-11) are given white robes, and of course eternal life, or there would be no point of white robes. And white robes were given unto every one of them; and it was said unto them, that they should rest yet for a little season, until their fellow-servants also and their brethren, that should be killed as they were, should be fulfilled." (Unquote: Their fellow-servants are the 144 000 Jews who are killed at the end of the Tribulation). Now note particularly that none of these under the altar were killed for the testimony to Jesus. They were not like Antipas who was slain for holding fast His Name. These are not born again ones, with eternal life as their possession. They come up in the resurrection and receive life because of their stand on the Word. And notice how these are crying out for vengeance. They cannot be bride material. The bride turns the cheek and cries, "Forgive them, Father, they know not what they do." These are Jews. They have to be because they are in the fifth seal, and it is in the fourth seal that the Gentile bride is gone in the rapture. So these Jews aren't born of His Spirit. They don't even believe that Jesus is the Messiah. But as they were blinded by God for the Gentile's sake, God gave them eternal life on the grounds that though they could not come to Him, yet they were truly faithful to all the Word they knew, and died for it as multitudes died under Hitler, Stalin, etc., and will yet die. It is the second resurrection wherein the five foolish virgins come up. Notice that they were virgins. They did not have the Holy Spirit so they missed being in the bride, while the five wise who had oil became a part of that bride. But these people, being a separated, God-loving people, and trying to abide in the Word, according to what they knew of it, and being a help in the work of the Lord will come up at the end of time. They will miss the millennium, which you can begin to see by these truths is much more important and wonderful than we have ever thought or believed. Chapter 7 tells us that the purpose of the Tribulation is for the two Jewish prophets Moses and Elijah to convert the 144 000 Jews to Christ. In addition, it will be a brutal shaking up of the vast number of complacent foolish virgins who were saved before the Tribulation started. They lost sight of Jesus and His Word, and were blinded by their denominational churches. Churches have been taken over by the pastors who rule them, and do not allow any disagreement with the pastor’s opinions. In order to belong, the people have to stop thinking for themselves and stop questioning. Nobody dares tell the pastor that he is wrong. In order to be accepted in the church, they must just accept what the pastor says. "Toe the official line and be subservient to the leader." The people become too complacently relaxed in the supposed safety of regular church attendance, so they ignore everyone outside their own church who tries to help them. Thus the people who only listen to their church teachings could not find the full truth of Scripture. The Catholics are led by the Pope, who is the only dictatorial ruler in Europe. The Protestants set up their church systems in the image of the Catholic system, by granting the pastor to have dictatorial powers over his church. Object to that, and you are out. When the Tribulation starts, people will find it a death sentence to disagree with the church leaders. The harsh truth of the Tribulation is that if you, as a saved Christian, reject the mark of the beast, which is enforced conformity to church doctrines, then you die. People today are scared to disagree with pastors. But in the Tribulation they will have to disagree and die. That will take courage. Then they will bitterly regret their lack of courage when they were in the churches and were so desperate to belong -- so scared of being unpopular, that they were frightened of disagreeing. But pastors disagree with each other. The church world is full of different opinions. Thus more than 45 000 different types of denomination have emerged. All of them are different but each church claims that it is correct. All these differences represent a real swamp to anyone who is prepared to think for themselves. In the horror of the great Tribulation, people will quickly lose their love of church membership as well as their love of their church leader who blinded them to the truth of Scripture. No-one loves a person who blinds them and deceives them and robs them of the top position in heaven, which is to be part of the Bride of Jesus. For the rest of eternity all these numberless people, who are saved but foolishly, not very Bible literate, will be second class citizens in Heaven. They can never be as close to the Lord as His Bride. When asked a Bible question now that they usually do not know the answer to, they reply that it is not important or that we do not need to know all the details, or that such knowledge is unnecessary. That is how they cover up their ignorance and lack of interest in Scripture. "Must we know? ", say the foolish virgins, who prefer church traditions like Christmas to Scripture. Nowhere in the Bible were we asked to celebrate Christ's birth. 25 December is not in the Bible, but is found in pagan ceremonies. "We must know! ", say the wise virgins who want to know everything about Jesus, the Word. The wise virgins were pulled out of the pit of paganism, and do not want to be pulled back in again. If elders had been in charge of the church, they could have opened the door to teachers who could have taught them the truth just from the written Word. Then they could have been part of the Bride. But only the pastor and his docile hirelings are allowed to teach in the church these days. Thus the church remains asleep and ignorant of much of the Bible. Revelation Chapter 7 opens with an extremely controversial statement about the "the four corners of the earth", as the earth is a globe. This statement is repeated in Isaiah 11:2. Both verses are dealing with God bringing back the outcasts of Israel. You cannot hold the wind, so this verse is not literal but symbolic. God is symbolizing something. Wind is a symbol of war and strife. So this verse refers to a time of war and strife, which are awful in themselves, yet under the control of God's angels. In the war-filled Tribulation, God is calling out the 144 000 Jews, who are to meet Jesus as their Messiah in Jerusalem. So before the Tribulation starts, God has to use wars to restore the Jews to their Promised Land. The Roman general Titus killed 1 100 000 Jews when he destroyed the Temple in 70 AD. In 135 AD, the Roman Emperor Hadrian killed 500 000 Jews, destroyed Jerusalem, and exiled the Jews from Israel. He then called the territory Palestine. So when the Gospel started, the Jews were scattered with much bloodshed. The hatred of the Jews by Arabs and other nations saw them endlessly persecuted. When God turned His hand to start restoring the Jews to Israel, the winds of war and strife would blow again. The Jews would pay with their blood and toil. But whatever the cost of the wars, God had the four winds under control. There are not just four natural winds on earth. God uses "four" to symbolize something. Four winds -- Note that Israel fought four major wars against the Arabs in 1948, 1956, 1967, and 1973. Holding the wind means that these four wars were all under the angel's control. Israel won each time against incredible odds. The 1948 war was a very close run struggle. Arab leaders made bad decisions that cost them. And these four battles resulted in the Jews establishing a homeland for themselves despite the Arabs wanting to annihilate them. The four corners of the earth symbolize that the Jews have been scattered far and wide for close on 2000 years. Their descendants will be found in the remotest places. Isaiah 11:2 And he shall set up an ensign for the nations, and shall assemble the outcasts of Israel, and gather together the dispersed of Judah from the four corners of the earth. So a corner symbolizes a hidden mystery. Behind the events of today's world, God is secretly working to restore the Jews to Israel. Donald Trump was condemned by every political poll in the run up to the 2016 American presidential election and had his character assassinated, his morals condemned, as well as having no previous political experience. He was tough, rude, abrasive, and argumentative. He had no hope of winning according to the experts worldwide. But he did win. Why? He was God's secret agent to restore Jerusalem as the capital of Israel. Nobody thought for a moment that God was using president Trump. God had everyone fooled, including the Devil. Thanks to president Trump, Israel turned a corner. An ancient prophecy was fulfilled. Jerusalem was made the capital of Israel on earth, in accordance with a supernatural prophecy that only God in heaven could have made more than 2600 years ago. We humans are not good at predicting the future. All the American polls could not predict who would win the election later that year. The world media and press says that President Trump's behaviour is just too far away from the standards that they expect. Distracted by his way-out unconventional manner on earth they do not see that God is using him in the spiritual realm to fulfill prophecy. He courageously declared Jerusalem as the proper capital city for the restored Jewish homeland. There the widely scattered 144 000 Jews will meet their Messiah, and become born again or heaven born. God's hidden plan of spiritual redemption for the 144 000 Jews is busy taking shape. A natural corner is where two walls or streets meet. So a symbolic corner represents God making the natural and the supernatural meet. We cannot see over the wall of time to see the supernatural in action. So God is shaping current Jewish history to fit in with His final plan for the Jews in the Tribulation. A corner also symbolizes the uttermost places that are far away. When dealing with Israel, God is looking into eternity as He sees the 144 000 getting Spirit-filled. So God is merging the supernatural with the natural. God has used war and strife to help with the gathering of the Jews who have been scattered far and wide on earth. Their natural gathering in Israel will ultimately fulfill the spiritual gathering of the Holy Ghost-filled 144 000 to meet their Messiah. This revival will produce the final outreach of God's heaven-born subjects. God blinded the Jews, so for 2000 years He has granted eternal life to those who stayed with the Old Testament and were killed for their faith. This secret salvation plan has seen scattered Jews from far, far away being able to find a place under the altar. The "winds" in the Bible means "wars and strife." Israel will be regathered during times of war and strife. "The four corners of the earth". We have to be very careful when we interpret what God says about the earth. This earth is temporary. It cannot last forever. But when God asks deep questions He is thinking in terms of eternity. That will require a brand new earth made of something far better than our present-day atoms. Scientists admit that our universe cannot last forever. We cannot even imagine what the future earth will look like. The ground of this earth was cursed by God in Eden. So God has got a new earth in mind. Built on something far better than our present laws of Physics and Chemistry. Look what God said to Job. The earth floats around in space, so what is God talking about when He asks for earth's foundations and corner stone? Are these literal or symbolic? Scientists admit that our universe cannot last forever. The sun will eventually burn up its nuclear fuel and swell up to become a red giant star that will consume the earth. God is talking about an eternal earth. Ours is a temporary earth, which will be done away with because John saw a new Heaven and a new earth. This earth was a testing time for our faith. For those whose faith stayed with the Bible, despite Science's theories of evolution and the Big Bang, God has a new and better earth in His mind as our final home. For the scientists who contradicted and criticized the Bible, Satan has a warm welcome for them. Evolution was supposed to start in the sea according to many scientists. So God will explode the sea and those flames will destroy the satellites in space, as well as the whole surface of the earth with all our deepest mines and all evidence of our scientific civilization. This is not a natural stone. This is Jesus, the Word of God. The end-time survivor who ends up here does it because of faith, not works. "Shall not make haste" means there will be no rat race, no traffic, no alarm clocks, no concept of time which so dominates our modern world. The person who is in the new earth believes the written Word. Faith in the Bible and Jesus is the sure foundation that will produce eternity. Only Jesus and the Bible can produce eternity. Scientists know that our physical universe cannot last forever. We will need a brand new universe made of something much better than our present atoms. We need a simple society that is based on faith, love, and innocence. Not based on scientific knowledge and money. Eternity can only be based on the Bible. In Christ alone we have a world without end. Then eternity can come into view. Ephesians 3:21 Unto him be glory in the church by Christ Jesus throughout all ages, world without end. The foundations of the new earth is the Bible. The New Testament written by the apostles, and the Old Testament by the prophets. The Cornerstone of the new earth that holds the New Testament foundation to the Old Testament foundation is Jesus Christ. So the whole earth has to be remade by Jesus if it is to last for eternity. What is symbolized by the number "four"? The four quarters of heaven refer us to the supernatural realm where the battle is between God and Satan. Heaven does not just have four places as there is a 'heaven of heavens' which goes way beyond what our imagination can grasp. The "four quarters of heaven" refer to a "four-fold heavenly plan" whereby God planned to redeem His church during the seven church ages. If we look at heaven, we see God on a throne surrounded by four beasts or living creatures that protect His people on earth. A heavenly or spiritual scenario cannot be accurately described in human terms as we just do not have the correct words to describe spiritual things. Heaven has its own set of rules that we cannot comprehend. 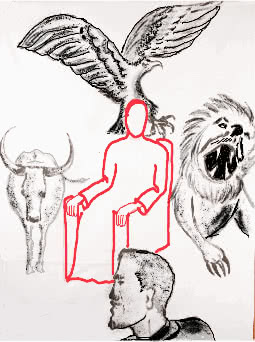 These beasts are in the midst of the throne (but that is where God is sitting) and round about the throne. This is God’s Spirit, that has four different ways of acting out or expressing His will. Four different ways of guiding and influencing his church during 2000 years of history. These creatures, or spirits, are full of eyes before and behind. No such creature exists in our human realm -- but eyes indicate wisdom. These supernatural beings are so full of wisdom that they already know the future that is before us, and the secrets behind the past ages of church history that are behind us. They represent the four stages through which God has built up His church over the 2000 years of the seven church ages. The lion spirit, as king of the beasts, guided the church during the early ages as the apostles established the New Testament with Jesus as the King, and the Bible as His infallible Word. The ox labours hard, and at the end is killed because its meat is too valuable to waste. The ox spirit enabled Christians to labour on and endure in the Dark Ages as they were killed in their tens of millions. The man spirit was the age of reformers, where human wisdom restored justification by faith under Martin Luther in Germany, and then John Wesley restored holiness and outreach in England which led to the great missionary age. In this man-beast age when human scholarship was blessed, the King James Bible was translated in 1611 by 47 scholars and then checked for about 158 years before the 1769 version was published. No other Bible had such a long proof-reading time. Thus it became the backbone of the missionary age and the Pentecostal outpouring. Then human wisdom and study reached its limits in terms of understanding the mysteries of the Bible. Why did Jesus write twice with His finger in the ground when saving a sinner woman? Remember, the ground was what God cursed in Eden. Churches just give up and say it is not important. Not true. Everything Jesus does is important. Why were 12 baskets and 7 baskets left over when He fed the multitudes? Matthew 16:9Do ye not yet understand, neither remember the five loaves of the five thousand, and how many baskets ye took up? Jesus expected them to understand how many baskets of rejected food were picked up. Do you understand? Are you even interested? Do you just evade His question? The churches focus on the miracle of thousands being fed with a boy's lunch. Jesus focused on the food that was rejected. The 5000 were fed with five loaves and two fish, symbolizing seven church ages because bread and meat symbolize doctrine. Jesus gave the food to the disciples who gave it to the people. Jesus gave the inspiration of the New Testament to the disciples who wrote it down. All the church ages have to learn from what was written in the Word. Then they were complacently full and rejected twelve baskets of food. This represents Laodicea, the church that is rich, increased in goods, and complacently full, and has need of nothing. Rejecting the restored Word of the first church age and pushing Jesus out of the church. But the written Bible that was restored at the end time will be rejected by the Gentile church. However it will be gathered up by the two prophets Moses and Elijah and then it will be fed to the twelve tribes of Israel. So churches today claim to have the Spirit of Christ but somehow they cannot then explain why there is so much of the Bible that is still not understood. Especially as the Holy Spirit comes to guide us into all truth. The flying eagle restored the Pentecostal power in 1906 with the Azusa street revival in Los Angeles. In 1963 seven angels came to William Branham in Arizona to commission him to reveal the mysteries of the seven Seals in Revelation Chapter 6. These mysteries should enable the Bride to be restored back to the beliefs of the early New Testament church, as set up by Paul and the apostles. If we have understood brother Branham's ministry, then the Bride should be able to follow their beliefs through the Bible verses, starting in Genesis the Seed chapter and ending in Revelation. So God guided His church down through history in four different ways. That is why the angels stood on four corners. Ezekiel prophesied of the Jews in exile as if they were scattered bones that needed four steps to restore them from the dead. Scattered in exile they looked like dead men’s bones. God worked through four vital steps by creating sinews, flesh, and skin before the fourth and most important step of breath brought the dead bones back to life. That fourth step will be the two prophets Moses and Elijah bringing them to the eternal life of the Holy Ghost baptism. :9 Then said he unto me, Prophesy unto the wind, prophesy, son of man, and say to the wind, Thus saith the Lord GOD; Come from the four winds, O breath, and breathe upon these slain, that they may live. :10 So I prophesied as he commanded me, and the breath came into them, and they lived, and stood up upon their feet, an exceeding great army. Notice how the four winds blew in the last stage. The real wars and strife will be in the Tribulation time. That is when the Jews will really be attacked, and only the two prophets with their supernatural power will be able to stop Israel being destroyed. Four movements of God’s Spirit, counteracted by four movements of Satan’s hellish demonic horde in the supernatural dimension. Four major Arab-Israeli wars fought in 1948, 1956, 1967, and 1973 had a common theme -- "Destroy the Jews, wipe them out and drive them into the sea". There are four winds of war that were fought to deny the Jews a homeland. These four war-angels who held or controlled the winds were concerned with the resurrection of the Jewish nation out of the hopelessly scattered exile that the Roman empire subjected them to. The Romans destroyed their Temple in AD 70, and the Muslims around 700 AD built the abomination of desolation, the Dome of the Rock and the Mosque of Omar, in the Holy Place where the Jewish Temple once stood. It takes a lot of wisdom to understand this Scripture. Rome destroyed the Temple, and stood on the Temple site. Then the Muslims built there. They gave birth to two alternative religions: Roman Catholicism and Islam. Both are condemned by Jesus. The Jews were hopelessly scattered and conquered by Rome, and then by numerous Moslem nations. But the Jews have to come back to Israel, however impossible that may seem. Four wars, or winds, established the modern Jewish state. In 1967 they won the six day war, but took over too much territory. They claimed the Sinai desert that never was part of the Promised Land. Then they had to fight the 1973 war which persuaded them to hand back the Sinai desert to Egypt. God wants them back in the limits He gave to Abraham. In the same way God wants His Bride only to believe doctrines that are limited to the written Word. A christmas tree and easter egg would never be part of that. Smoking, drinking, swearing, dirty jokes, dancing, living in sin, divorce and re-marriage are off-limits to Christians. Those habits are outside the realm that God wants Christians to live in. If we persist, then the Tribulation will purge us from our sinful habits. Jesus spoke of two angels who would help restore the Jews. An angel is a messenger or prophet. Two prophets, Moses and Elijah, with the great sound of the Gospel trumpet, will gather the 144 000 Jews together in Jerusalem to meet Jesus as their Messiah. When you become born again, a spirit body forms for you in heaven. As your faith grows the spiritual muscles in that new body grow. When you die, then your spirit leaves your earthly body and steps into your spiritual body. The 144 000 are all killed at the end of the Tribulation. Since they are born again of the Holy Spirit, Who operates in the heavenly dimension, all their spiritual bodies that may have formed far apart in heaven will be gathered together to receive these born-again martyrs. The two prophets have to collect 144 000 Jews that are scattered all over the world, with some of them in the remotest areas. They are brought to Jerusalem to meet their Messiah, and become born again and Spirit filled. Then they die, and because they are firstfruits, they are resurrected in their heavenly, immortal bodies that were prepared for them in Heaven. Their purpose is to protect the Bride when the Lord returns for Armageddon. Revelation 14:1 And I looked, and, lo, a Lamb stood on the mount Sion, and with him an hundred forty and four thousand…. So the 144 000 are heaven-born subjects, as well as being widely scattered Jews on earth before the two prophets call them back to Israel. God works in four spiritual stages to redeem His people -- Satan copies this, and does likewise. 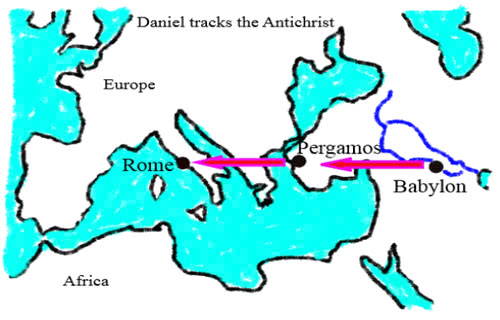 So in the Old Testament Satan began his master plan, using four Gentile kingdoms. :3 And four great beasts came up from the sea, diverse one from another. Four demonic powers arose as powerful warlike kingdoms: Babylon, Medes and Persians, Greeks, and Romans. The Babylonians were bright. They invented pagan beliefs that would later infiltrate the churches. The head of gold -- golden ideas like "Your stars foretell" which still appear in our daily newspapers and magazines, and a belief in a trinity. 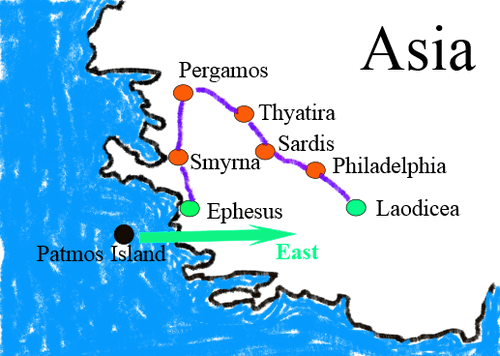 The Babylonian priesthood fled to Pergamos when the Medes and Persians conquered Babylon. When Greece conquered Persia, Alexander then declared himself to be god. When he died, his empire was split in four and these four generals declared themselves to be gods too. So the Pontiff or High Priest of the Babylonian mysteries in Pergamos also declared himself to be god. The four generals died and the idea of a Greek being god faded away as the Greeks lost power. But the Babylonian High Priest became king of Pergamo,s and set up the only genuine line of succession of priest-kings who were descended from the original Babylonian mystery priesthood. Pagans regarded Babylon as being the real centre of pagan worship. The Babylonians were the real deal when it came to a mystery religion. Being descended from the original Babylonian priesthood gave the Pergamos priest-king or Pontiff a legitimate claim to be god. In 133 BC Pergamos became part of the Roman empire. The Babylonian Pontiff played no real role, until in 63 BC Julius Caesar bribed his way to become Pontiff. Julius Caesar became dictator of Rome and gave the office of Babylonian Pontiff much prestige. Roman emperors kept the title of Pontiff until 378 AD when the emperor Theodosius rejected the title, saying that a Christian cannot be a pagan Pontiff. By 400 AD the Roman bishop was calling himself Pontiff or Pope. The Babylonian mysteries had infiltrated the Roman Catholic church, which became Mystery Babylon the Great. To this day the Catholic people regard the Roman Catholic church as the mother church of the world. They regard the Protestant churches as their daughter churches. Revelation Chapter 6 showed the antichrist spirit as a rider on three horses that would merge to form the fourth horse. White was religious deception because a bow with no arrow is a bluffer. Around 860 AD Pope Nicholas I was the first western church leader to wear a crown. Red showed political power that exterminated any dissenters. Babylon always ruled by force. Black was the demonology of money power. Christianity became big business. Few people are more ruthless than a pastor protecting his income. The last horse was pale or green (chloros in the Greek). The Holy Spirit leaves as the church is caught up. Life leaves, and Death enters. A corpse is first pale as the three colours of white, red, and black merge then turns green. This is a dead horse walking, ridden into the Tribulation by Death -- Satan. These four stages of church history were necessary for the development of the Roman church so that it could dominate the whole world. Each horse began its ride in a certain Seal time, but then continued to ride through the next Seals until it reaches the Tribulation where the three horses merge, as an awful trinity, into the final pale horse of death during the fourth Seal. A pale corpse will turn green as it begins to rot. The Devil's followers are basically the walking dead during the Tribulation. So what does God mean when He speaks of the four corners of the earth? Corners in the Bible mean remote areas. Places that have been forgotten. Places that are far, far away. "Four corners of the earth" is mentioned twice. Both times only in connection with the regathering of the Jews back to Israel. "Corners" means that God is doing a hidden work that most people are missing. Barak Obama missed God’s plan with Israel completely by allowing the United Nations to condemn Israel two weeks before he stepped down from power. The United Nations completely missed God’s plan with Israel by voting 128 – 9 against President Trump making Jerusalem the capital of Israel. Hitler missed God’s plan for Israel completely by trying to exterminate the Jews. His hatred destroyed 6 million. But that just made the world briefly sorry for the Jews and the United Nations then voted them a homeland in Palestine. The Palestinian Arabs missed God’s plan for the Jews in 1948. Instead of agreeing to have a Jewish state and a Palestinian state, they got greedy and declared war to exterminate the Jews. Against all odds, they lost. They lost in 1956. They lost in 1967. They lost in 1973. Four wars, four winds of war and strife. But Israel could not be destroyed. The Arabs kicked out 800 000 Jews who lived in Arab countries in retaliation for the 750 000 Arabs that were either encouraged by their leaders to leave Israel or else forced out by the Jews during the war of 1948. In 1951, UNRWA admitted that their list of 711 000 registered Palestinian refugees was grossly padded, mostly by residents of the West Bank and Gaza Strip who had lived in those areas prior to partition. These people were moved out by the British mandate, just as certain Jews were moved out of Palestinian territory before the 1948 war ever started. As a matter of interest, the Beirut Institute for Palestinian Studies released a report in 1970 that stated "68% of the Palestinians left their homes without ever seeing a Jewish soldier or hearing a shot fired". Tiny Israel absorbed the 800 000 Jews, because the four angels held the remote corners of far-away forgotten places in the wilderness where Jews were living. Thus Arab hatred fulfilled Scripture, because the Arabs were searching for and finding these Jews and sending them back to Israel. God’s hidden plan, done in a spiritual corner that the enemies of Israel missed. They thought they were punishing the Jews. Even those Jews thought that they were being punished. All 22 Arab nations, with an area bigger than Europe, failed to absorb the displaced 750 000 Palestinian Arabs. Looking east from Patmos John would have seen Ephesus, where Paul was the messenger, and Laodicea where William Branham was the messenger. Paul taught the Holy Ghost baptism and established the New Testament truth. Brother Branham restored the last church age back to the same Holy Ghost baptism and New Testament teachings of Paul. This sets the tone for the area that is east of Patmos. So when John saw a mighty angel rise in the east, this angel would be involved in bringing the 144 000 Jews to the same Holy Ghost baptism of the first and the last church ages. The angel would also be involved in bringing to the Jews the same Bible truths that Paul had preached, and that brother Branham had restored. God has a plan for the 144 000 Jews. They must receive the Holy Ghost during the Tribulation. They will be restored to the Bible beliefs that Paul had taught. 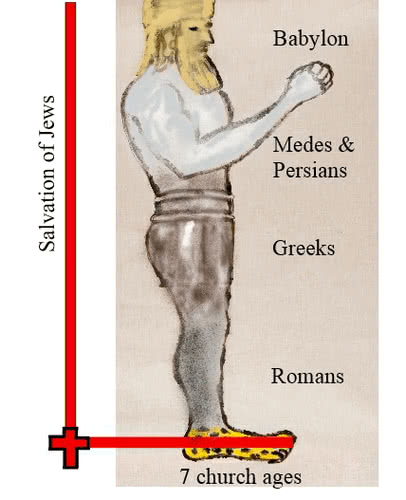 Paul's age was symbolized by the lion-beast. The lion is the king of the beasts. Thus all the church ages must be subject to what Paul and the apostles wrote in the New Testament. Jesus is the Word of God. That makes Him King. The seal of God is the Holy Ghost baptism. If they're Christ denying, Christ rejecting, they are sealed in apostasy by the devil. If they're God-fearing, God-loving, borned again Christians, they're sealed with the Holy Ghost to Eternal destination. The Holy Spirit is the seal of God. The 144 000 must receive the Holy Spirit. In their foreheads are their brains, with which they think. Thus they only think the thoughts of God. They only think in terms of the written Scripture. These four angels hold the power of warfare to destroy the whole world. But warfare must be restricted so that Israel is not destroyed. God now set out on a secret plan to restore the Jews back to Israel. The hidden reason for the First World War, that started in 1914, was to remove the Ottoman Turks from their control of Palestine, and allow Britain to rule Palestine. In 1917 Britain promised the Jews a homeland in Palestine. The hidden reason for the Second World War was to massacre 6 million Jews, and make the world briefly feel sorry for them. The United Nations then voted them a national state together with a Palestinian state. The hidden reason for the 1948 war was to get the Arabs to reject the United Nations plan of two states in Palestine. By attacking Israel, the Palestinian Arabs actually ended up losing territory. Jordan took the West Bank and East Jerusalem. Egypt took Gaza. Syria took the Golan Heights. Jordan and Egypt had no claim on those territories other than that they had conquered it in a war. The Palestinian Arabs got nothing, but never complained about Jordan and Egypt hijacking their territory. The hidden reason behind the 1967 war was to get Egypt, Jordan, and Syria to claim that they would wipe out the state of Israel. This allowed the Jews to kick Jordan out of the West Bank, Egypt out of Gaza, and Syria out of the Golan Heights. Arab greed and hatred lost them even more territory, while the state of Israel grew bigger. The First World War was horribly destructive. It ended strangely at 11 o’clock on 11 November (11th month) 1918 when Germany surrendered, although they had not been fully defeated -- because the sailors’ mutiny in Germany was spreading through all of Germany where people were rioting and starving. So the war just stopped. Palestine had been conquered by Britain from the Turks. In 1917, British Foreign Secretary Balfour had decided on a national home for the Jews in Palestine. Thus began the negotiations and the fighting that led to Israel becoming an independent state in 1948. The main spiritual purpose of the First World War was to remove the Muslim Turks from control of Palestine. In the aftermath of the war, where 20 million people had been killed, a terrible Spanish Flu swept the world with an estimated death toll of probably 65 million people. This devastated the nations, and in those bleak circumstances the spirit of dictatorship emerged from the pit of hell in the form of Mussolini in Italy, Lenin and then Stalin in Russia, and Hitler in Germany. There were also many lesser dictators like Franco in Spain, and Tito in Yugoslavia. These natural dictators were to unleash their destructive demonology on natural Israel. This reached its awful climax in the Holocaust, the murder of 6 million Jews by Hitler, during the Second World War. With the war ending in 1945, the demons had to stop this natural murder, and moved into the church realm to unite them in the rejection of the King James Version of the Bible, and the establishment of denominational religion. Their aim is basically to stop the end time Christians from returning to the beliefs of the first church age that are written in the New Testament. But an unexpected result of World War 2 is that the nations briefly felt sorry for the Jews, and voted them a homeland in Palestine. The Palestinian Arabs objected, and five Arab nations attacked the Jews. Miraculously, the Jews won. So the Palestinians missed the plan of God. Their hatred of the Jews and their greed in trying to eliminate the Jews, ended up with the Jews getting a bigger portion of Palestine than originally agreed on. So the World Wars were under the control of God. A corner is where two walls or edges meet. The natural and the supernatural. God was controlling events so that Israel could regain their Promised Land. The parable of the labourers in the vineyard. The first workers were the apostolic church at the beginning. The eleventh hour workers are the Jews that come in during the Tribulation. They get the same reward, the same Holy Ghost baptism. What is the Seal of God? What is the Seal of God? Ephesians 4:30. "Grieve not the Holy Spirit of God, whereby ye are sealed until the day that the church is redeemed up into glory." Now, again, we'll pull another Scripture, Ephesians 1:13, Paul speaking. Galatians 1:8 said, "If a angel from heaven, come preached anything else, let him be accursed." Yes. "After you believe, ye were sealed with the Holy Ghost of promise. After you believed, you..."
Now twelve tribes are mentioned, but Dan and Ephraim are left out. :6 Of the tribe of Aser were sealed twelve thousand. Of the tribe of Nepthalim were sealed twelve thousand. Of the tribe of Manasses were sealed twelve thousand. :7 Of the tribe of Simeon were sealed twelve thousand. Of the tribe of Levi were sealed twelve thousand. Of the tribe of Issachar were sealed twelve thousand. :8 Of the tribe of Zabulon were sealed twelve thousand. Of the tribe of Joseph were sealed twelve thousand. Of the tribe of Benjamin were sealed twelve thousand. This is strange. Dan and Ephraim are missing. Joseph and Levi have taken their places. Why is that? When Jeroboam took ten tribes to become the nation of Israel, he set up golden calves in the cities of Dan and Bethel. Bethel is in the land of Ephraim. 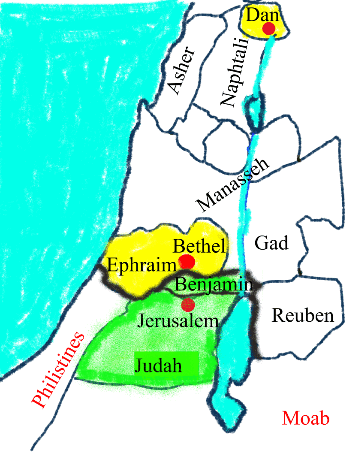 Judah was the green territory consisting of the tribe of Judah and Benjamin, the two sons of Rachel. Rachel died when Benjamin was born. Judah represented the seven church ages. Benjamin represents the 144 000, who receive the Holy Ghost baptism but die in the Tribulation. Israel was the white area and the two yellow tribes where the golden calves were set up. King Jeroboam of the northern territory of Israel made a big mistake. :29 And he set the one in Bethel, and the other put he in Dan. Thus the northern kingdom began to worship golden calves. So Bethel was in Ephraim. :20 The LORD will not spare him, but then the anger of the LORD and his jealousy shall smoke against that man, and all the curses that are written in this book shall lie upon him, and the LORD shall blot out his name from under heaven. The first heaven is the Millennium, the thousand years of peace. The first taste of heaven on earth because Jesus is ruling. "Under heaven" means before the Millenium. 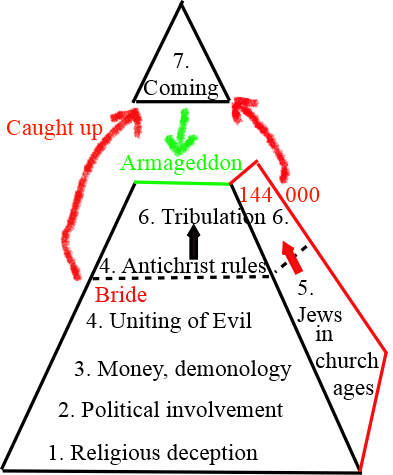 The Tribulation comes before the Millennium. So when God calls out the twelve tribes during the Tribulation, these two tribes are missing. A huge number of people in heaven. These are the foolish virgins. They were saved before the Tribulation started, but were blinded to Scripture by their church leaders. They have to be purged from their unbelief in the Tribulation. Jesus has to get off the mercy seat to come down and claim His Bride. Then mercy is over. So no Gentiles can get saved in the Tribulation. God promised the Jews salvation if they believed the Old Testament. Because God blinded them, they could not accept their Messiah. Thus, the Jews who remain obedient to the Old Testament are granted salvation if they die for their faith. God has to make a special exemption for them. But the Gentiles have no excuse. We blind ourselves to truth by preferring church traditions to the Bible. We prefer to listen to our church leaders rather than to Jesus, Who is the Word.. They are no longer putting their church leaders first. God takes first place in their lives now. :12 Saying, Amen: Blessing, and glory, and wisdom, and thanksgiving, and honour, and power, and might, be unto our God for ever and ever. Amen. :13 And one of the elders answered, saying unto me, What are these which are arrayed in white robes? and whence came they? :14 And I said unto him, Sir, thou knowest. And he said to me, These are they which came out of great tribulation, and have washed their robes, and made them white in the blood of the Lamb. These are they which came out of great tribulation... (in other words, the great tribulation)..
:16 They shall hunger no more, neither thirst any more; neither shall the sun light on them, nor any heat. :17 For the Lamb which is in the midst of the throne shall feed them, and shall lead them unto living fountains of waters: and God shall wipe away all tears from their eyes. The foolish virgins are killed in the Tribulation. But in the process they are purged, and realize that following their human pastors was wrong. When it is all over they have learned that the Lamb, the Word of God, should have been their Head and Leader. But unfortunately, they die in the Tribulation, and miss the 1000 year reign of peace. When they rise in the general resurrection, they go to Judgement Day, but are spared because they were saved before the Tribulation. That will the unfortunate price they pay, because they promote the opinions of human leaders above the written Scriptures. But God is a jealous God. And the human leaders that they exalt are going to be exposed and humiliated and killed with them. So the lesson that the sleeping virgins have to learn is that there is no human priesthood above the people who are saved. There is no New Testament priesthood of an exalted five-fold ministry. All saved Christians are priests. Show me by the Bible what's greater, in the Bible, than a local elder to a local church? That's right, yes, sir, the sovereignty of the local church, each church in itself. Each church should be run by its elders. No New Testament church was run by a pastor. The word "pastor" is only mentioned once in the New Testament, yet was condemned six times in the Old Testament. This ministry cannot be trusted to run a church. There is no Scripture that says a shepherd is the pastor. Pastors were not part of the Old Testament hierarchy of priests and Levites. So Jeremiah is prophesying of New Testament pastors. Wind is war and strife -- Too much hot wind from the pulpit. :3 And I will gather the remnant of my flock out of all countries whither I have driven them, and will bring them again to their folds; and they shall be fruitful and increase. :4 And I will set up shepherds over them which shall feed them: and they shall fear no more, nor be dismayed, neither shall they be lacking, saith the LORD. The New Testament says that the elders run the church and feed the flock. We have got away from this Bible pattern. The Tribulation will make the congregations lose all their confidence in their pastors. No one person is in charge of a church. Paul said the same thing. Modern church leaders are not really concerned about what they teach, as long as they can be in charge and get the money. God promised to bless very small groups. He also promised to be outside every church. Jesus does not appeal to the church as a group. Just to an individual who is inside the church. The early church met in houses. Romans 16:5 Likewise greet the church that is in their house. Here we get an example of a home church that was in Laodicea. Sadly we have deviated in our churches from what the New Testament teaches.